Considering organizing a swap but not sure how to do it? 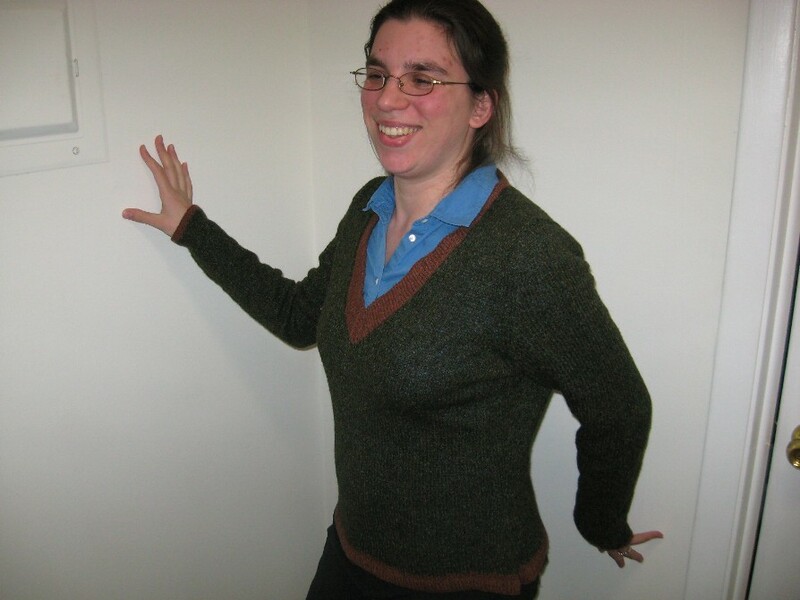 Teresa Porri, pictured above in a sweater she knitted, shares her experiences with organizing yarn swaps at her home. I was inspired enough by the set up of Share Tompkins that I decided to host an occasional swap of my own with a very specific focus: fiber arts. People who are not interested in working with string may not be aware of this, but Ithaca has dozens if not hundreds of talented spinners, knitters, crocheters, and lacemakers. I happen to know a bunch of them, and I happen to know that this is a group that often has big plans that don’t pan out, so we often end up with extra materials. I set up my dining room table on one side of a room with as many leaves as it holds, then had chairs in a circle next to it for people who wanted to socialize, knit, and eat. The most recent time I hosted the yarn swap, I put a laundry basket to one side with a “FREE” sign on it. One problem, though: I always seriously underestimate the amount of yarn that shows up. Some people make multiple trips to carry it all. The table overflows onto the floor, where bag and Rubbermaid tubs full of yarn sit ready to go. Having each person keep their yarn near them is easier organizationally, but having a communal pile seems more inviting. Some people carefully label skeins, but most people use the “hold up a skein and holler that they like it until its owner shows up” method of identification. Having one or two people who bring a TON of yarn also seems to serve as a social lubricant. It’s partly that generosity thing again – the person who brings a ton of yarn usually doesn’t want to bring it back home! But it’s also really fun to mix and match and daydream with like-minded folks. Having a computer handy was useful; there were occasional checks on Ravelry or yarn sellers to find out the fiber content of something, or the retail price, or to remind someone what weight yarn they needed for that gorgeous scarf pattern that they’d seen recently. One great side effect of this kind of trading environment is that it seems to be a great stimulant for creativity. People talk about what they had in mind when they bought the yarn, people hold two very different colors together and try to figure out how to mix them together. One person describes a pattern they saw, and two weeks later you’ll see someone else knitting it with yarn they got at the swap. I’m knitting baby toys and a sweater for my niece who will be arriving this summer from swap yarn, and my head is chock-full of plans I didn’t have before. If you’ve had an idle thought about doing something like this, I really encourage you to try it. I’ve had great fun with it and will definitely hold more yarn swaps in the future.